Gold River flows into the head of Muchalat Inlet on the west coast of Vancouver Island. The logging town of Gold River is approximately 14 km ( 9 mi.) north of the port, which consists of a public wharf, two large floats for fishing boats and docking facilities for float planes. Gold River can be reached from the west side of the island by M.V. Uchuck that operates a freight and passenger service in Nootka Sound, by or traveling Hwy 28, southwest from Campbell River. This instant town, built in 1965, was Canada's first all-electric town and the first to have underground wiring. Today, Gold River is a modern village with all necessary conveniences. Located in the Gold River Valley, there is excellent fishing here. It is also known as a spelunking centre and the home of the M.V. Uchuck III. A converted U.S. minesweeper, The Uchuck offers a freight & passenger service in and around Nootka Sound. Climate: Typical west coast marine climate. Cool and wet winters. Warm summers, with day time temperatures in the low 20 degrees Celsius range. Main Industries: Logging, fishing, and tourism. The Great Walk is an annual fund raising event sponsored by the Tahsis Lions Club. It takes place on the 63.5 kilometres of gravel logging road between Gold River and Tahsis on Vancouver Island, and covers some of the most beautiful and rugged ciuntry in the world. The Great Walk has been sponsored by the Canadian Volksport Federation. Access: By road, take Highway # 28 southwest from Campbell River. 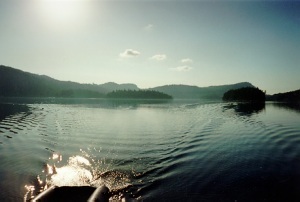 Gold River is reached from the Pacific Ocean by way of Nootka Sound, and Muchalat Inlet. Regular scheduled air service and charter service is available from Campbell River. Recreation Facilities/Activities: Community Centre, boating, canoeing and kayaking, hiking and caving. Local Attractions: The Upana Cave System, west of Gold River. The Uchuck III that offers freight and passenger service in Nootka Sound, Esperanza Inlet and Kyuquot Sound. Accommodations: Gold River, BC offers lodging at motels, hotels, resorts, bed and breakfast, RV parks and campgrounds.